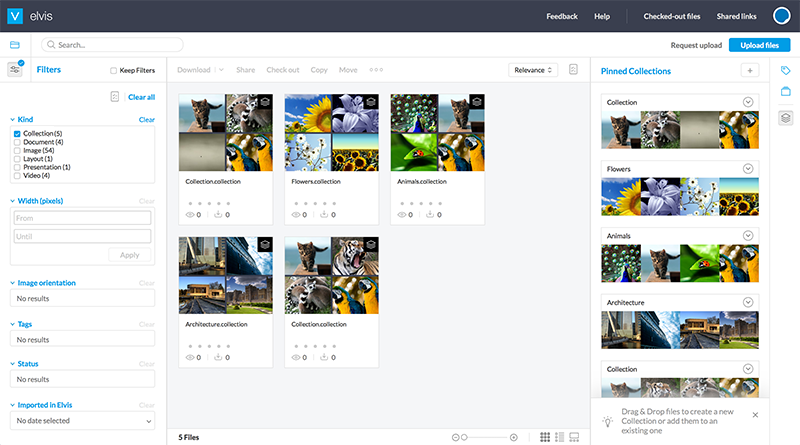 Collections are containers or virtual folders used for collecting and organizing content. Typically, this content is related in some way: they are files of a photo shoot, files related to a story in a publication, files of a product, files you want to share with someone, and so on. This article explains in detail how to work with Collections in the Pro client of Elvis 6. An important concept of Collections to be aware of is that a Collection contains references to files in Elvis and not the actual files themselves. Compare it to creating a shortcut to a file on your desktop: you can access the file by double-clicking the short-cut, but it is not the actual file itself. In this respect adding a file to a Collection is different from adding a file to a folder. You can add the same file to different Collections. For each Collection a reference is made to the original file. The file itself therefore only exists once in Elvis. When removing the file from a Collection or deleting the Collection itself, only the reference to the file is removed and not the file itself. When deleting the original file from Elvis, all references in all Collections are also removed. The easiest way to work with Collections is to pin them in the Pinned Collections panel. This makes it easy to manage Collections by creating them, opening them, adding files to them and deleting them, all from one central place. To access the Pinned Collections panel, click the Collections icon in the toolbar on the right of the page. The Pinned Collections panel is accessed by clicking the Pinned Collections icon (A) in the toolbar. Drag an existing Collection from the Search results onto the Pinned Collections panel. Create a new Collection (see later in this article). Tip: To change the order of the Collections, simply drag them into the correct position. When creating the Collection by right-clicking the folder in the Folder browser, the Collection is stored in that location. All users that have access to that location can see the Collection. Info: This feature requires Elvis 6.30 or higher. There is no limitation to the number of Collections that can be added to another Collection. The easiest way to add files to a Collection is to drop them on a Pinned Collection. Make sure therefore that you pin the Collection first. Alternatively, drag the files onto a Collection that is visible in the search results. Note: Dragging files onto a Collection in the Folder browser is not supported. You share a Collection by sending a hyperlink (referred to as a 'Shared Link') to the recipient. This hyperlink gives that recipient access to only those files in Elvis that you share through the Collection. The Shared Link can be sent to anyone, including those that do not exist as a user in Elvis. No log-in is required to view the files. 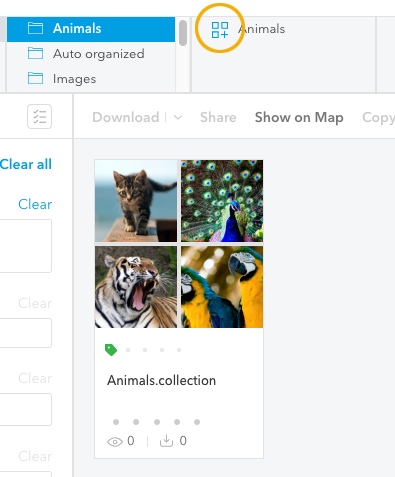 Instead of using a Collection to share files, you can also share files individually. 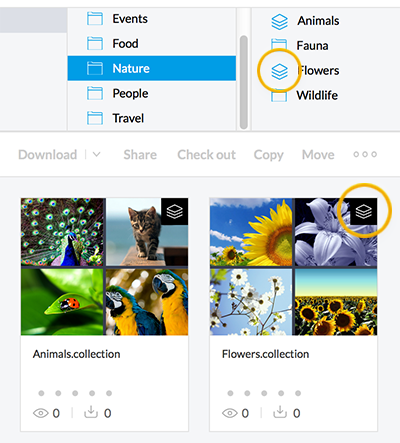 The benefit of sharing a Collection though is that they are dynamic: when adding or removing files from the Collection, these changes are also visible to the user of the link. The process is identical to sharing individual files. For a full description, see Sharing files with others using the Pro Client of Elvis 6. As with all other files in Elvis, Collections also have metadata properties. Note: To learn more about metadata in the Pro Client, see Working with metadata in the Pro client of Elvis 6. Metadata is very important when it comes to searching for files and for filtering the search results, so make sure to add as much relevant metadata to the Collection as possible. Note: Changing the metadata of a Collection has no effect on the metadata of the files in the Collection. Checking-out files. To open all files for editing, select the Collection in the Search results and click 'Check Out' in the menu. Downloading files. To download all files, select the Collection in the Search results, click 'Download' in the menu and choose a download method. 9 April 2019: Added section 'Adding a Collection to a Collection'.